Polycarp was born around 69 AD and was a central figure in the Early Church. Having been instructed by the Apostle John himself, Polycarp is a principle link between the Apostolic Age of the Church and Christian life of the Second Century. In his youth, Irenaeus knew him. He was also a close friend of Ignatius of Antioch and it was probably at Polycarp’s request that Ignatius wrote his famous epistles to the various churches in Asia Minor. Only on e of Polycarp’s letters has survived, his Epistle to the Philippians. In it he warns against the rising Marcionite heresy, a dualistic faith that rejected the Old Testament and much of the New Testament. What this heresy kept of the New Testament, it distorted. During much of his life, Polycarp was in many ways the leading figure of Christianity in Asia Minor, and he was referred to with great respect and affection by Irenaeus and Ignatius. He served, for many years, as bishop of Smyrna (located in modern Turkey, famous in the First Century for Emperor worship, and one of the churches the book of Revelation was sent to; Revelation 1:11; 2:8). As a very old man Polycarp was arrested for his Christian Faith. Great effort was expended to get him to recant his faith in Jesus and to offer a sacrifice to Caesar. Polycarp refused saying, “I have served him (Jesus) eighty-six years and in no way has he dealt unjustly with me; so how can I blaspheme my king who saved me?” (The Martyrdom of Polycarp 8:3). For his faithfulness he was burned alive in a great bonfire. An account, written by eye-witnesses, has survived, the Martyrdom of Polycarp. The day was February 23, 155. 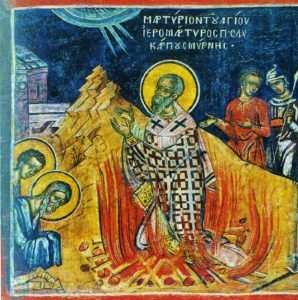 The Martyrdom of Polycarp continues to encourage believers in times of persecution. Polycarp certainly knew the meaning of Christ’s words, “For what does it profit a man to gain the whole world and forfeit his soul?” (Mark 8:36). He laid up treasures in heaven that far surpassed any gain he might have been able to acquire on this earth. So, not only does he encourage those who are persecuted for the faith, perhaps even forfeiting their lives, but he also encourages us to value that which has true worth. Prayer: O God, the maker of heaven and earth, You gave boldness to confess Jesus Christ as King and Savior and steadfastness to die for the faith to Your venerable servant, the holy and gentle Polycarp. Grant us grace to follow his example in sharing the cup of Christ’s suffering so that we may also share in His glorious resurrection; through Jesus Christ, our Lord, who lives and reigns with You and the Holy Spirit, one God, now and forever. Amen.